Related to this is the integration with your Android Wear watch which will now detect and coach you when you are performing push-ups, sit-ups and squats. Naturally this activity is added to your activities for the day within the Google Fit app so you can keep track of all of it in one place. Perhaps the biggest news in this update however is the integration with other nutrition and sleep apps. 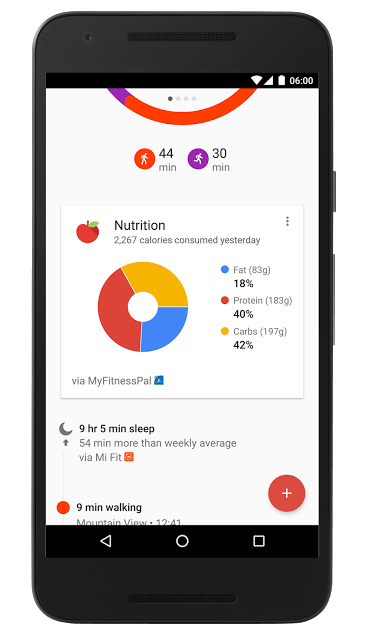 As most readers will know, I’m a big user of MyFitnessPal and while I can’t log my diet information in Google Fit directly, it will link up with the MyFitnessPal app so I can view that nutrition information in Fit. In other words, I don’t have to bounce back and forth between the apps. I can input my diet once in MyFitnessPal then get a more comprehensive picture of my fitness activity & nutrition in Fit. The update to Google Fit is rolling out now and updates to the other apps and services will have to take place in order for integration to fully take place. For example, MyFitnessPal hasn’t integrated for me yet and I’m assuming that is going to require an yet-to-be-received update to the app on my devices. The bottom line is give it a few days folks so your apps can update and the integration can happen.